We would like to congratulate Betsy and Chris on their wedding! 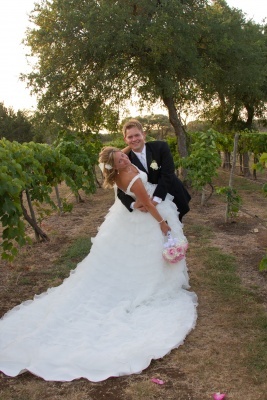 The wedding was held at The Vineyards restaurant in Garden Ridge, Texas on Friday June 17, 2011. It was a simple family event that was very loving and intimate. Betsy chose summer shades of pink and yellow for her bouquet. Her sister wore the same pink and carried white hydrangeas with pink rose accent. Immediately following their wedding the couple went inside for their delicious meal provided by the Vineyards. The couple then cut the cute little brides cake and headed out for photos. I want to wish them the best in life as they are so in love and deserve it, congratulations!